Summer is just around the corner and Memorial Day weekend is here to kick off a great summer of fun, sun, and whitewater rafting. To help you get your plans in order for the weekend, we are offering a great special to raft on Saturday for Sunday’s discounted rate. 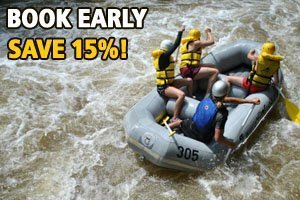 This special applies to rafting on the Middle Yough, Lower Yough, and Cheat Canyon guided tours. Just mention promo code MDSO to take advantage of this great discount. We wanted to share some fun things happening over the holiday weekend, besides all the cool stuff here at Laurel Highlands Outdoor Center. Spend some time really getting to know the Ohiopyle State Park with some really informative and fun hikes. For centuries, people have gathered local plants and infused them with water to make tea. During this program, park naturalists will introduce you to some of these teas and let you try a taste. They’ll also talk about the history of tea in general and how it has shaped many facets of our culture. Meet at the Train Station Visitor Center next to the bike trail right in Ohiopyle. From the Train Station Visitor Center, right in Ohiopyle, you will hike across the low bridge and onto the Ferncliff Peninsula. Along the way park naturalists will talk about what makes Ferncliff such a special place. Also stop by the fabulous old Ferncliff Hotel site and talk about Ohiopyle at the turn of the century. Moths seem to be a misunderstood species. Meet at the Kentuck Campground amphitheater to learn why these creatures are so crucial to our ecosystem and why they really are butterflies of the night!